flying public to support new routes to China. 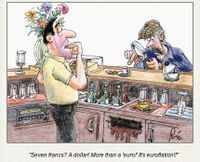 EUOBSERVER / BRUSSELS - Slovenian euro coin production has begun as the EU finance ministers on Tuesday (11 July) gave a final formal go-ahead for the country's entry to the 12-member eurozone as of January 2007. The Slovenian central bank must distribute 155 million euro coins and 42 million bank notes by the beginning of the next year. More than 38 years after he used a £75 21st birthday gift from an aunt to found a magazine named after a Dave Brubeck record, Tony Elliott, the founder of Time Out, has made a discovery that he is especially excited about. ...The discovery is this: that there are other cities here in the United Kingdom with the vibrancy and culture to justify a weekly Time Out magazine of their own. Next February, Elliott plans to launch simultaneously in Manchester and Liverpool. ...his next target is the West Coast. "I believe we can establish a business in Los Angeles and will do it in about 18 months, two years' time. The big question in LA is the relation between online and print. It's very spread out and is maybe a good place for us to explore a slightly different model, with online leading and print being a supplement to online." ...The most recent addition to the portfolio was Time Out Almaty (which, in case you didn't know, is the cultural capital of Kazakhstan). Launches will take place next year in Kiev, Delhi and Barcelona as well as Liverpool and Manchester. The "wrong Manchester" is the new "wrong Sydney"
Remeber a few years ago when a young English couple had their 15 minutes of fame by booking tickets to Sydney, Nova Scotia instead of Australia? MANCHESTER, N.H. --Before this week, Jim Hourihan of Liverpool, England, had never heard of Manchester, N.H. But thanks to a mix-up, he ended up there this week while trying to fly to another Manchester -- the one on the other side of the Atlantic. Hourihan boarded a Continental Airlines flight in Los Angeles on Monday, but it wasn't until he got on a connecting flight in Cleveland -- a 50-seat regional jet -- that he realized he was headed to New England instead of jolly old England. "When I first saw the plane I thought, 'That's not going to Manchester, England,'" Hourihan told WMUR-TV. "And it was then that it dawned on me. There must be two Manchesters." The article continues on to say that he was flown to MAN for no additional charge, and brings up the issue of MHT's new name (Manchester Boston Regional Airport)- I imagine a lot more people will book to Manchester thinking that they're going to Boston than England, but will be almost as wrong. Hourihan said he liked Manchester, but felt it could use a few more pubs. I've written before about the Fall's legendary line-up changes. Now, Mark E Smith offers his advice to England's Soccer/Football coach Sven Goran Eriksson. but you don't want to be going round their houses. there's no way they'll be on top of their game. It's not a job for life. the breach, cos you never know when you might need them in an emergency. firing squad if they don't score. up in the front garden. We were very popular that week"
· Mark E Smith was talking to Dave Simpson. It's not just americans getting fatter: "Heftier Australia may give boost to toilets"
SYDNEY, Australia — Toilets may need to get sturdier as a result of the country's increasingly obese population. The current industry standard for toilet seats is 100 pounds, and Standards Australia is looking to increase it to 330 pounds, spokeswoman Kate Evans said. Oh sure, you hear about how everyone plays hockey in Canada, gets to the rink by dogsled and then goes home to an igloo. But many myths about Canadians that circulate in the United States aren't nearly so silly or harmless. Perceptions that Canada is soft on immigration, routinely harbours terrorists and supplies most of the U.S. with marijuana are potentially a lot more unsettling to cross-border ties. That's one reason why the Canadian embassy in Washington is assembling an army of ex-pats as it battles the errors spouted by U.S. television pundits and repeated at dinner parties. Alex Waibel doesn't understand Chinese, but he can read street signs when in Beijing. A team of engineers led by Waibel at Germany's Karlsruhe University has developed a heldheld device called the Sign Translator. It uses an integrated camera and software that recognizes, and translates into English, about 3,000 Chinese characters. The Sign Translator is the cutting edge of a raft of breakthrough developments in translation technology coming down the pipeline. Governments in Europe, rather than corporations, are driving much of the innovation—and with good reason. Consider the European Union: in Brussels, the world's largest translation and interpretation operation spends more than $875 million a year ferrying information in and out of the bloc's 21 official languages. Prince Charles flies British Airways Club World- "Such is the end of Empire"
... Of the outward journey, the Prince said that his British Airways 747 departed with a large party of official representatives from Britain and he found himself and his staff “on the top deck in what is normally club class”. The Prince said he then discovered that other dignitaries, including Edward Heath, Douglas Hurd, “the new Foreign Secretary Robin Cook”, several former Governors of Hong Kong, Lord Wilson and Paddy Ashdown, then the leader of the Lib Dems, were all “ensconced in First Class immediately below us”. PRAGUE, Feb 6 (CTK) - The Aerofilms company has hired a volunteer to spend an entire month eating nothing but typically unhealthy Czech cuisine as part of an experiment accompanying the local distribution of the feature documentary Super Size Me, Ivo Andrle from Aerofilms told CTK today. "Man uses first-class ticket to get free meals for almost a year"
It took snow in London for me to know there's such a thing as "the etiquitte of snowball fights"
Feeling gravity's pull: is Peter Arnell the Alan Sokal of the ad world?